To decompress from the crazy week, hubby and I went to Tres Agaves last night, a trendy Mexican restaurant serving authentic cuisine and tart margaritas on the rocks. Not 14 pounds of beans and cheese with sweet lime slushies posing as margaritas. We were mesmerized watching the huge, auto-feeding machine slice and juice big batches of limes just for the margaritas. 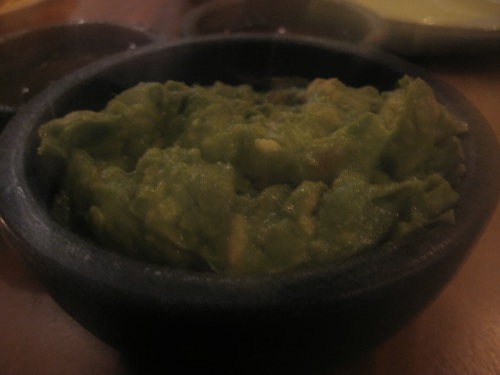 They actually had a great raw selection starting off with the guacamole appetizer and maybe a chip or two. 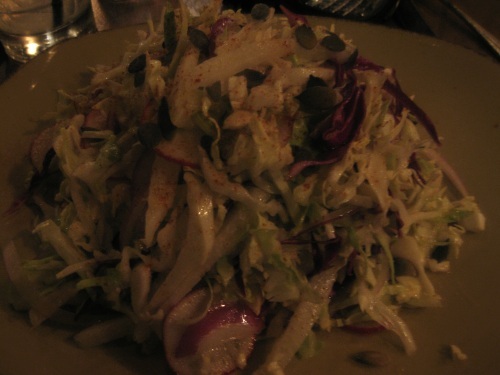 Then the huge jicama, cabbage, orange and radish salad topped with pumpkin seeds and a light citrus dressing. Even the oranges in the salad were fresh chopped, not the syrup-packed canned variety. I wasn’t expecting to find a raw dish there, so this was a pleasant surprise and good to know another local place with a solid raw vegan option. Maybe it was the stressful week, the two margaritas last night, or a little of both because I slept in until 8:30 AM this morning which is really late for me. I’ve been exhausted most of the week from work and being on call and must have been making up a bit. When I did finally drag my lazy rear out of bed, this little one was even lazier. 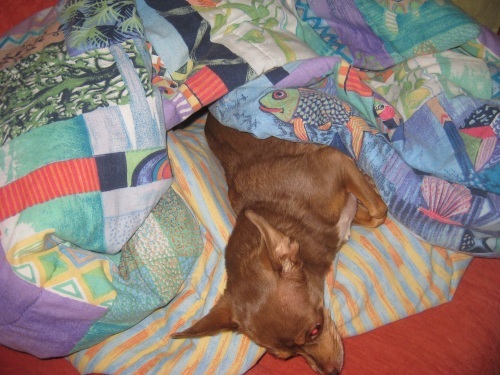 I had to dig her out of her comforter cocoon and coax her into the backyard. It could be 100 degrees outside and she still sleeps deeply nestled in a comforter tomb. 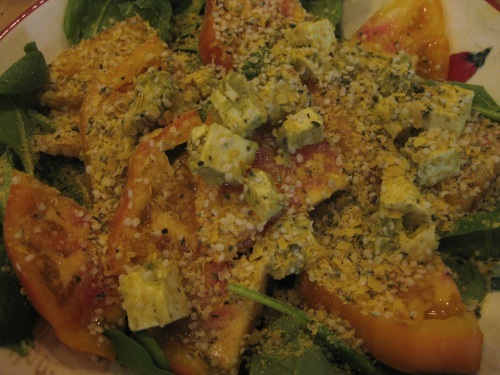 After a productive, though not productive enough, morning of hitting the gym, cleaning and bill paying, I threw together a quick lunch of spinach, heirloom tomato slice, leftover cooked tofu chunks and hemp-esan alternative Parmesan topping for to good salad. Chilled and marinated tofu cubes make a great quick salad topping. Glad you slept in. Glad you were productive but there is just never enough time to cram it all in…is there!